This morning I had some time to kill and I made a quick trip to the local Michaels craft store. What I found were several good ideas that could be used to cheaply augment a Frugal GM's table. I'm sure there are probably a ton more ideas/products available in the store, but here were three that jumped out at me. The first thing I found was this bag of moss foliage. Pretty inane stuff I realize, but if you make your own trees, this moss is perfect for just such an endeavor. At the model hobby store a bag goes for $15-$20, but at Michaels it is only $6. 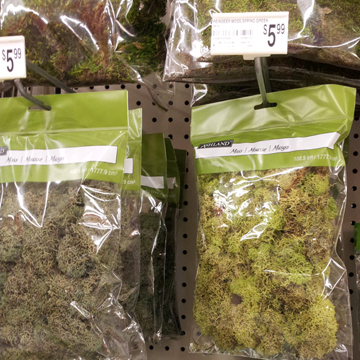 For $6 you could afford to get several bags in order to mix & match you get a good blend of colors on your trees. Trees are rarely a solid color, but the bags of foliage mix are just that. In order to get a blend of colors using moss from traditional gamer hobby stores you'd have to spend $50+. 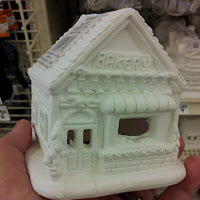 My next find wasn't as cool and might require a bit more work, but for $5 it might be worthwhile to add to your burgeoning collection of terrain houses. This cute porcelain bakery shop could have the name filed off easily and then painted to be any type of small store or residence. This particular location only had a couple different models, but if the line is larger than what I found here, there is a lot of potential. This house would have to be quite upscale for certain, but could you imagine it as a higher-class establishment in a nicer part of a large town? My last find is my favorite. 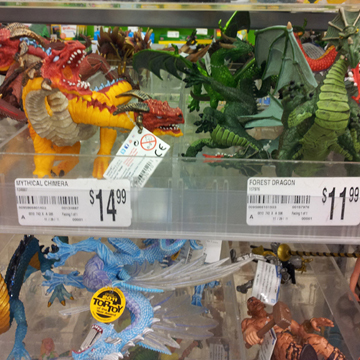 Every time I come to Michaels I check out the kid's toys. Most of them are extremely out of scale, but a few are close to perfect. For $12-$15 you can pick up any one of several dragons or even some giants. As you can see on the left these are already painted up....just waiting for you to plop them down in front of your players.